Sharing creates value; putting up barriers destroys it! Silos divide teams, hamper creativity, and blind us to both risks and opportunities. And yet, it’s impossible to get rid of silos completely, so how can you better manage their negative effects? To meet the increasing demands of complex products, services and transactions, since the 1950s companies have adopted functional organizational structures, which revolve around the specialist skills of their employees. In other words, in the typical company, engineers focus on technical aspects, product managers on marketing, and financial controllers on monitoring costs. Under this model, however, ultimately nobody tends to communicate with anybody. While expertise undoubtedly has its virtues (especially in terms of process optimization), it becomes dangerous when taken to extremes. When company stakeholders are confined to their individual fi elds, they lose sight of the “big picture” — no matter how bright they are. Silos hamper the flow of information, ideas, and talents, and suppress innovation and collaboration. Worse still, silos conceal significant risks. For example, Gillian Tett believes that the 2008 crisis was caused in part by the countless silos that compartmentalized and segregated the world of finance. 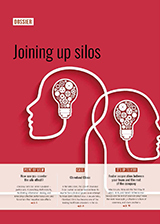 We need to rethink the silo structure of our organizations so they can become more seamless. Sony — the innovative company of the 1970s and 1980s — lost its competitiveness when silos began to wear it down in the 1990s. The Japanese giant was organized into competing divisions, some of which (including PlayStation) have remained highly profitable. But the company was unable to respond to the major technological shifts of the last twenty years, even though internally it had all the resources needed to negotiate these developments with ease. By contrast, Apple persuaded its engineers to work across its entire product range. The iPod, for example, represents the culmination of a global vision that very early on combined downloading, using other equipment (such as computers), music copyright management, and more. A range of departments at Apple — design, production, marketing and distribution — worked hand-in-hand under the leadership of Steve Jobs to devise the future of digital music. As a basis for this type of strategy, Tett recommends that 10% of each team should be made up of “cultural translators”: generalist profiles who can understand and speak the languages used by different departments, business lines and services so they can link them together. According to British anthropologist Robin Dunbar, the optimal size of a human group is 150 members – any larger than that and you begin to see a detrimental effect on interpersonal connections. Based on The Silo Effect, The Peril of Expertise and The Promise of Breaking Down Barriers, de Gillian Tett (Simon & Schuster, September 2015) and The Cleveland Clinic Way: Lessons in Excellence from One of the World’s Leading Health Care Organizations by Toby Cosgrove (McGraw-Hill, January 2014).